The very first single that I bought with my very own money as a kid was “Fame” by David Bowie. “Right” was Side B. I would dance all weird to it, not being able to really pick up any definitive beat or pinpoint any kind of melody to that song – much different than singing and moving to church music. This was my introduction to punk. I was intrigued. Even though it’s deep into October, the day is gorgeous and the Los Angeles weather is threatening 85 degrees. I slip on some shorts and a t-shirt and grab a big water. Today I decide to take a bus so it can drop me off just far enough to get a good walk in before I meet up with a couple friends at the Gallery. At the end of a walk through West Hollywood, I arrive at The Taschen Gallery at the corner of Beverly Blvd. and Crescent Heights. Enormous bright letters painted across the building names the exhibit, even bigger than the “Taschen” signage on the roof. I see it from two blocks away. There is no mistaking I’m headed for the right place. They open their doors at 11 am. I’m there by 11:05. My friends meet me shortly thereafter. The Taschen Gallery is a bright open space too big for me to estimate the square footage. At first glance I see the walls are rich with photos and I’m greeted with a “hello.” As we check out the photos, we’re asked if we want a sparkling water. I decline but my friend accepts and she’s offered a choice of flavors. Fancy for the price of free admission. 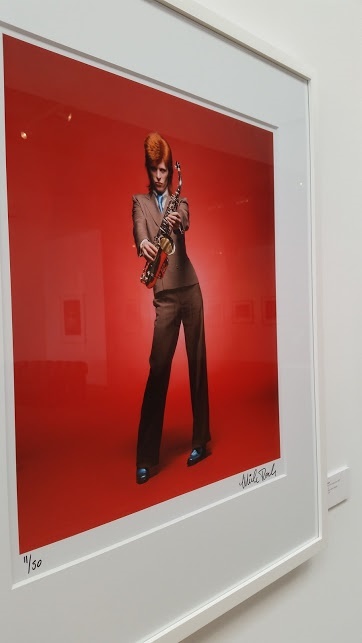 The Taschen Gallery opened its doors in December 2014 with “It’s Just a Shot Away: The Rolling Stones in Photographs.” Since The Taschen Gallery’s debut, there have been four exhibits – this Bowie exhibit being the fourth. Each Taschen exhibit is chosen based on one of the many books Taschen, a publisher of fine art, has published. 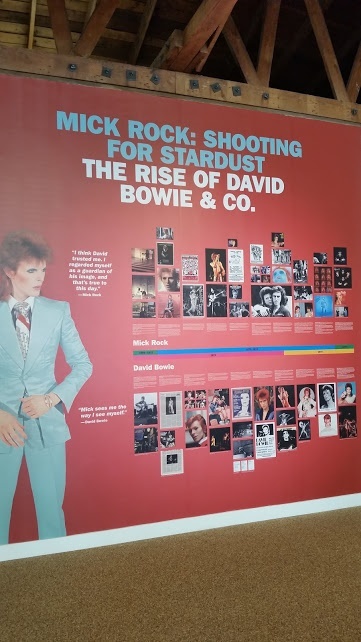 At the rear of the space stands a time line showing the span of Mick Rock’s career from college through photographing David Bowie and many other musicians, including Lou Reed and Blondie. It’s an easy and a quick follow to educate the visitor. 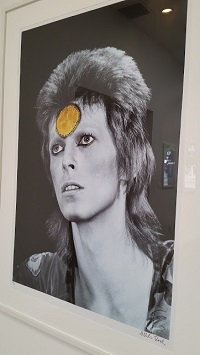 Most of the space feature’s Mick Rock’s works. I’m particularly fascinated with the photograph of David Bowie holding a saxophone. The Taschen crew tells me that, yes, Bowie plays the saxophone too. 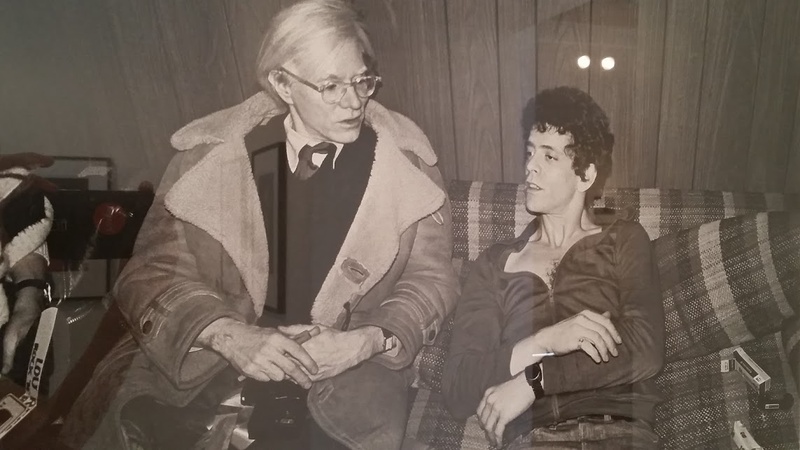 I’m also fascinated by his photograph of Andy Warhol and Lou Reed. Such a great snapshot of two famous artists chatting. I stand there for minutes wondering, what they were talking about? The next great project? Their philosophy on life? Or merely the everyday mundane? Like, what are they going to eat for dinner the next day? As I continue to walk toward the rear of the Gallery, I’m glad to discover additional small spaces. These spaces would be hidden if I weren’t to walk all the way back to the rear. Here hang several other photographers’ works. The one that particularly fascinates me was taken by Ellen von Unwerth, a photograph from her series, “The Story of Olga.” I’m captivated trying to figure out the truth of what is really happening here. Is this a beautiful daring woman excited by the promise to participate in some kind of provocative event, only to be lead to her demise? Or, simply, can she just not stand the sight of the mud she must step through to get to The Ball? Before we leave, there on display for visitors to peruse is a book of Annie Leibowitz’s works – a woman well-known for photographing celebrities. The book is heavy and heaving with interesting photographs of every celebrity imaginable. A great flip-through for the star-crazed. 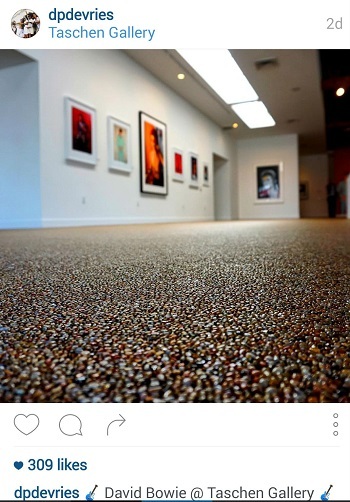 Go to Yelp and you’ll see that this gallery has $$$$ with a short quip “Ultra-High End.” Don’t be fooled. The gallery is free. The photos are not. Moreover, the quadruple $ designation also refers to the few books they choose to sell at the Gallery. The expensive ones. The Bowie exhibit has been extended through October 30, 2015. Next up will be Michael O’Neill: On Yoga, opening November 7, 2015 running through January 2016. Go to The Taschen Gallery if you want more information. No. Mick Rock is not dead. You can follow him on Instagram @therealmickrock for more of his photos. As for David Bowie, word on the street is that he’s retiring from being “on the road.” UPDATED 1/11/2016: Sadly, David Bowie passed away 1/10/2016 at the age of 69.